Posted March 7, 2016 by Rob Cowley & filed under Consignor Canadian Fine Art News & Press. (Toronto – January 29, 2016) As Consignor Canadian Fine Art puts the finishing touches on plans for their spring season of auctions and events, they have announced that the Spring Auction of Important Canadian Art will be a live auction, taking place on May 31st in Toronto. The sale begins a new tradition for Consignor, with live auctions of Important Canadian Art held twice a year, during the spring and fall, surrounded by the schedule of online auctions which the firm has established over the past three years. In addition to the live auction, this spring will include online auctions of Works on Paper & Prints (February), Canadian & International Artwork (March) and a Second Session of Canadian Art (June), to follow the live sale. The consignment deadline for the live auction will be in mid-March and Consignor is currently viewing artwork for consideration for this inaugural event, as well as the schedule of online auctions approaching in the coming months. Consignor continues to offer their standard all-inclusive selling commissions and the lowest Buyer’s Premium in the industry. To arrange a complimentary and confidential consultation, please contact Consignor’s specialists at 1-866-931-8415 or [email protected]. Further details regarding the live auction will follow as the May sale approaches. (Toronto – November 26, 2015) Consignor Canadian Fine Art is nearing the end of another successful year with the close of the Fall Auction of Canadian Art on November 25. The auction invited active client participation from across Canada, with a wealth of consignors, bidders, buyers and visitors to our downtown gallery leading to strong bidding competition, notable results and a high sell rate for the November sale. Emerging and established collectors bid well into the evening from the comfort of their homes using Consignor’s proprietary and specialized online auction software. The evening’s high achievers included fine examples by Frank Johnston (and fellow members of the Group of Seven), Illingworth Kerr and Manly MacDonald, three of the many works which fetched values well beyond their pre-sale estimates. A rare nocturne painting by Johnston captured bidders’ interest, March Midnight selling for $12,650 (all prices include the 15% Buyer’s Premium), more than double its estimate. Illingworth Kerr also rocketed past its expectation, Mountain Moon ultimately achieving $11,500, tripling the estimate. Manly MacDonald’s impressionistic painting of the iconic University of Toronto Hart House also easily passed its estimate, Hart House in Winter inviting strong comptetion between bidders and selling for three times the expectation. Each of these paintings found homes in private collections across Canada, the fall auction generating interest and bidding from clients nationally and internationally. Artwork by the Group of Seven showed particular strength during the sale with examples by Arthur Lismer, J.E.H. MacDonald, A.J. Casson, and Frank Johnston performing strongly. Other Canadian historical artists highlights included paintings by John William Beatty, Frederick Loveroff, and John McNaughton, with rare examples by the three painters inspiring competition from bidders. Loveroff’s The Portage, a spectacular oil on canvas that hung comfortably among his Group of Seven counterparts, sold for $19,550, one of the highest prices ever achieved for the painter’s work at auction. A luminous canvas by J.W. Beatty, a favourite during Consignor’s extensive previews in November, sold for $32,200, one of the highest auction results for the celebrated artist’s work, a result deserving of Baie St. Paul‘s evidence of Beatty as a true master of light and colour. Equally sought during the fall auction were modern and contemporary artworks by Jean Paul Riopelle, Gershon Iskowitz, Jean-Paul Jerome, William Kurelek, Ted Godwin, William Winter and Maud Lewis, all of whom continue to enjoy excellent results through Consignor’s online auctions. Riopelle’s Sans titre (PM16) fetched $41,400, the estimate exceeded for the wonderful example of the artist’s signature style executed on a unique oval canvas. Captivating paintings by Iskowitz and Godwin were favourites during the November preview, Violet-A and Hidden Valley (B) selling for $17,250 and $21,850, respectively. Select highlights from the Fall Auction of Important Canadian Art can be viewed by following this link. From the entire team at Consignor Canadian Fine Art, we thank you for supporting us in 2015 and we wish you the best holidays with family and friends. Stay tuned to our website, Facebook, Twitter and Instagram to keep up-to-date on exciting news and events for 2016! Posted November 9, 2015 by Rob Cowley & filed under Charity Auctions, Consignor Canadian Fine Art News & Press, Consignor Updates, Sale Updates. (Toronto – November 9, 2015) – This November, Consignor Canadian Fine Art offers exceptional examples of Canadian art for emerging and seasoned collectors alike. Consignor’s specialists have carefully selected artworks that, together, compose an auction that caters to the interests of a diverse group of collectors. The fall auction includes a range of styles and periods, from landscapes by the Group of Seven, John William Beatty, and Frederick Loveroff, to modern abstracts by Jean Paul Riopelle and Gershon Iskowitz, and a compelling sculpture by acclaimed prairie artist Ivan Eyre. More than 120 artworks will be open for bidding online between November 18 and 25, 2015. Auction highlights include Gershon Iskowitz’s Violet – A, the 1979 canvas estimated to fetch between $20,000 and $30,000. Blues, purples, greens and yellow radiate from this lively abstract painting, capturing the essence of the artist’s most celebrated style. Another Canadian giant on offer is Jean Paul Riopelle, with four artworks available, including a stimulating oval shaped canvas, Sans titre (PM16). Thickly painted in the style for which he is most recognized, Sans titre (PM16) is estimated between $30,000 and $40,000. For collectors interested in more historical artwork, a rare large oil on canvas by Frederick Loveroff entitled The Portage ($20,000 – $30,000) depicts a landscape typical of his Group of Seven contemporaries, yet distinct in its human presence. Portaging was a physically demanding but essential method of transportation for artists during the first half of the twentieth century who wished to experience the rugged Canadian wilderness. Loveroff’s depiction is a rarely seen perspective in historical paintings from this time. Three contemplative artworks by celebrated prairie artist William Kurelek round out this season’s offerings. To My Father’s Village ($10,000 – $15,000) commemorates a significant moment in the artist’s life as he travelled to his father’s village in the Ukraine soon before he passed away. Kurelek had a deep and complex relationship with his father and, as a first generation Canadian, Kurelek felt compelled to visually explore his family’s roots and his generation’s immigrant stories in the prairies and in Toronto. Continuing our tradition of cross-country consultation with clients, Consignor recently held a Valuation Day event at Mayberry Fine Art in Winnipeg. The day was a hectic one, attracting interest and excitement from individuals throughout the region. Consignor and Mayberry’s specialists were kept busy throughout the day, viewing and researching artworks in order to provide some insight to the owners. The consultations led to multiple consignments towards Consignor’s fall auctions, however the clear winner at the end of the day was Winnipeg Harvest, the Valuation Day event held to benefit the charity. Thank you to all who attended and shared your day with us! Below Lydia and Rob speak with Winnipeg media regarding the Valuation Day event. The Consignor Spring Auction of Important Canadian Art offered several rare examples of exceptional Canadian paintings, prints and sculpture, enticing both local and international buyers to its semiannual online auction, leading to strong results for an array of artwork. Emily Carr ‘s Arbutus Trees, dated 1908, was featured in the May auction as a rare and striking watercolour that showcased Carr’s early experimentation with brilliant hues of orange and purple. 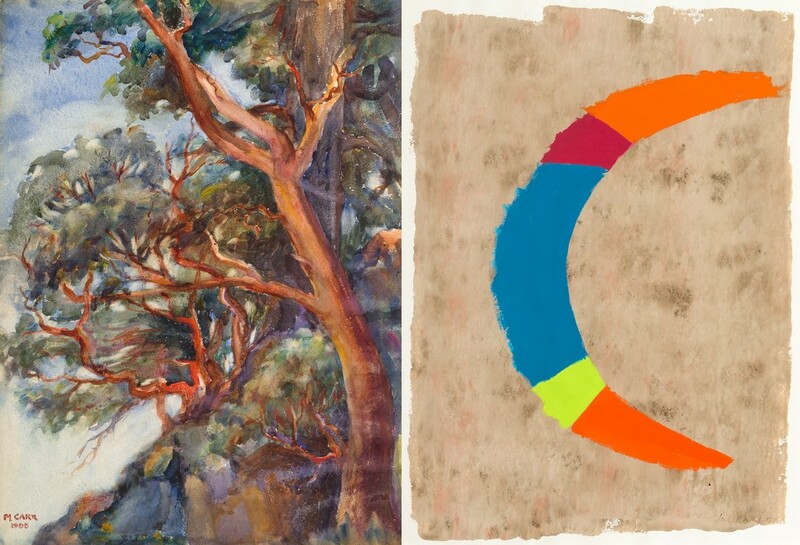 Consignor’s standard four-week preview period allowed buyers and enthusiasts alike the opportunity to see Arbutus Trees in context, as the Art Gallery of Ontario was serendipitously exhibiting “From the Forest to the Sea: Emily Carr in British Columbia” at the same time. Carr’s Arbutus Trees sold comfortably for $52,900 (prices include Buyer’s Premium). Another special painting in Consignor’s May auction was Manly Edward MacDonald’s Logging Scene. The piece was enthusiastically recognized as an excellent example of the artist’s skill and style. This brought on feverish bidding, which ultimately took Logging Scene far above its pre-sale auction estimate to $9,775. Consignor also continues to see excellent results on works of art by Jack Bush. Following the record-breaking success of Consignor’s sale of Jack Bush’s Summer Lake last spring, gouache on paper, Quarter Moon, made its auction debut and exceeded its estimate at $41,400. The artwork was featured predominantly in the main gallery and received praise by both experts and passers-by. An additional highlight was John Goodwin Lyman’s Portrait of Marcelle, which sold for $40,250. This portrait, circa 1935, was painted during the climax of Lyman’s career, and is a masterful demonstration of his preoccupation with light, volume, and the human figure. Portrait of Marcelle was selected as the cover illustration for the catalogue of the 1986 travelling retrospective exhibition and remains one of the artist’s largest portraits. The results from the auction demonstrate that, whether historical or post-war, quality Canadian artwork is being sought by collectors across the country and beyond. Consignor Canadian Fine Art is a leading auction house, sometimes discovering special works of art on its free valuation days. Consignor regularly visits St. John’s, Halifax, Montreal, Ottawa, Winnipeg, Calgary, Vancouver and other cities to meet with clients personally for review of their artwork. To inquire about upcoming valuation days or for questions about consigning, please call toll free 1-866-931-8415 to speak with one of our specialists, email [email protected]. (Toronto – April 28, 2015) – On the heels of a much lauded Emily Carr retrospective exhibit at the Art Gallery of Ontario, lies directly across the street at Consignor Canadian Fine Art, a rare and exceptional earlier work by Carr that has never been seen before by the public. Arbutus Trees (1908), a 14.5” X 10.75” watercolour (estimated value $50,000 – $70,000), was acquired by a private owner directly from Carr herself, who at the time was an aspiring artist honing her craft. It has since remained in the family’s estate for more than a century, and will hit the auction block for the first time at Consignor Canadian Fine Art’s Spring Auction of Important Canadian Art, May 20 – 28, at consignor.ca.